MEMPHIS—Thousands of fast-food cooks and cashiers announced Thursday they will walk off their jobs and protest nationwide Feb. 12 – the 50th anniversary of the historic Memphis sanitation strike – carrying on the fight for higher wages and union rights led by hundreds of black municipal workers whose 1968 walkout became a rallying cry of the Poor People’s Campaign led by Dr. Martin Luther King, Jr.
“Fast-food cooks and cashiers like me are fighting for higher pay and union rights, the same things striking sanitation workers fought for 50 years ago,” said Ashley Cathey, a 29-year-old Memphis fast-food worker. On Feb. 12, fast-food cooks and cashiers in two-dozen cities across the Mid-South will walk off their jobs, demanding $15 and union rights. They’ll be joined by thousands of workers protesting in another two-dozen cities across the country, paying homage to the 1968 strikers and vowing to continue their fight, and showing support for the Mid-South strikers and the new Poor People’s Campaign. The actions stretching from coast to coast on Feb. 12 will culminate in a 1,500-person march from Clayborn Temple to Memphis City Hall – the same route sanitation workers walked 50 years ago – led by strikers in the Fight for $15 from across the Mid-South; Memphis sanitation workers who participated in the 1968 strike; the Revs. Dr. William Barber II and Dr. Liz Theoharis, co-chairs of the Poor People’s Campaign: A National Call for Moral Revival; Mary Kay Henry, president of the Service Employees International Union; Coalition of Black Trade Unionists Founder Bill Lucy, who collaborated with Dr. King during the 1968 strike; and other national labor and civil rights leaders. “The fight for strong unions was at the heart of the original Poor People’s Campaign, and it must be at the forefront of our effort as well,” said the Rev. William Barber II, co-chair of the Poor People’s Campaign: A National Call for a Moral Revival. “The 1968 sanitation strike was a groundbreaking moment for our country that showed the American people that labor rights, economic rights, human rights and civil rights are all inextricably linked,” said Lee Saunders, president of the American Federation of State, County and Municipal Employees. 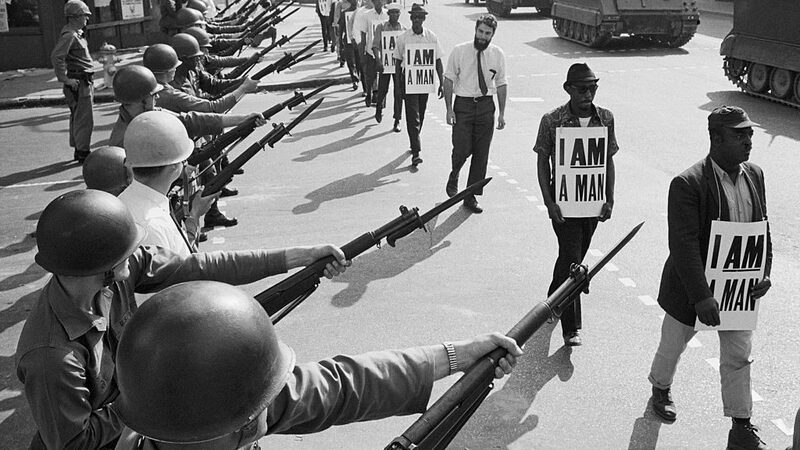 Ahead of the strike and protests, the Fight for $15 launched a new website where visitors can create their own versions of the iconic “I AM A MAN” sign. People visiting the site can enter their own descriptor in lieu of ‘MAN’ and share their customized sign on social media. Submissions will be turned into printed signs that workers will carry in Memphis on Feb. 12. The Feb. 12 strikes and protests come as politicians have cut minimum wages and attacked unions across the country, disproportionately harming workers of color. Workers in predominantly Black cities including St. Louis, Mo., Kansas City, Mo., and Birmingham, Ala., have had minimum wage increases nullified by white state lawmakers in recent years. Meanwhile, union jobs in state and local government – which have historically provided a pathway to the middle class for workers of color – have been under attack from corporate-backed politicians like Illinois Gov. Bruce Rauner, who has refused to bargain a contract with state employees for nearly two years to break their union. “Now more than ever, working people need strong unions so they can fight back against racist politicians who work hand in hand with corporations to keep people of color locked in poverty,” said SEIU President Mary Kay Henry. In the summer of 2014, the NAACP passed a resolution backing the Fight for $15; in the winter of 2015 Memphis sanitation workers who participated in the 1968 strike implored a gathering of fast-food workers at Dr. King’s church in Atlanta to keep fighting for $15 and union rights; and faith leaders of all stripes have echoed the workers’ moral argument for dignity on the job. Workers have developed deep ties with the Movement for Black Lives and marched alongside activists calling for racial justice from Ferguson, Mo. to Baton Rouge, La, to Milwaukee, Wisc. In April 2017, workers in the Fight for $15 joined together with the Movement for Black Lives for a wave of “Fight Racism, Raise Pay” protests across the country. Members of the Memphis chapter of the Fight for $15 participated in the movement that led to the removal of Confederate monuments in the city late last year.